Even though I have been doing more and more mountain biking and bikepacking and less road riding, I still do some occasional road rides. And there is still one road cycling event that I really like. It's called 'Eteläkärjen ajot - Sydspets Rundan', which roughly translates Southpeak's Ride. This road motion cycling event is organized in Raasepori. Compared to some big events in Finland, like Pirkka Cycling and Myllyn Pyöräily, this is a small event that usually have only 60-80 participants. The event fee is only 20€, and for that you get a medal, 3 service points, a meal in the finnish and if you are lucky, a lottery prize. But what really stands out for this event is the 120 km route. It is incredibly beautiful. If your initial thought about road biking is boring with big, straight roads, you can forget that with the Southpeak. The only slightly boring road is right after the start, but when the route turns to Snappertuna, it's pure road biking paradise! The roads are small with lot's of twists and turns. The roads go almost all the time up and down, the total elevation being at 905 meters. And with this you are accompanied with absolutely beautiful scenes and landscapes, not to mention all the beautiful small villages and ironworks that have really nice feeling indeed. The weather forecast was promising with partly sunny skies and temps near +20°C. I didn't prepare for this event very well, as I just didn't want to. My only goal was to have a nice day in the saddle and enjoy the familiar route. As there was those 3 service points, I didn't even take anything to eat with me. Just one bottle of water. I was also a little late for the start but the plan was to ride my own speed so it didn't bother me at all. The first service point is at 48 km, so I knew that I would have a little hard time after the first hour of riding. And yeah, I was not far away from bonking, but I slowed my pace just a little and managed to reach the service point fairly comfortably. The service points are pretty primitive, containing only salt cucumber, bread and juice. But that is just enough to have some energy to keep going, so no problem here. After this things went smoothly. I knew that the next two service points weren't far away, and I would survive. I was riding with too low energy levels for sure, and my pace wasn't fast, but hey, I didn't come here to rip my legs. I can't simply praise the route enough. I have already a plan for the future to ride with a lots of breaks and take hundreds of photos. My road bike after the ride. The front wheel is from my time trial bike as the inner tube of the original wheel was broken. 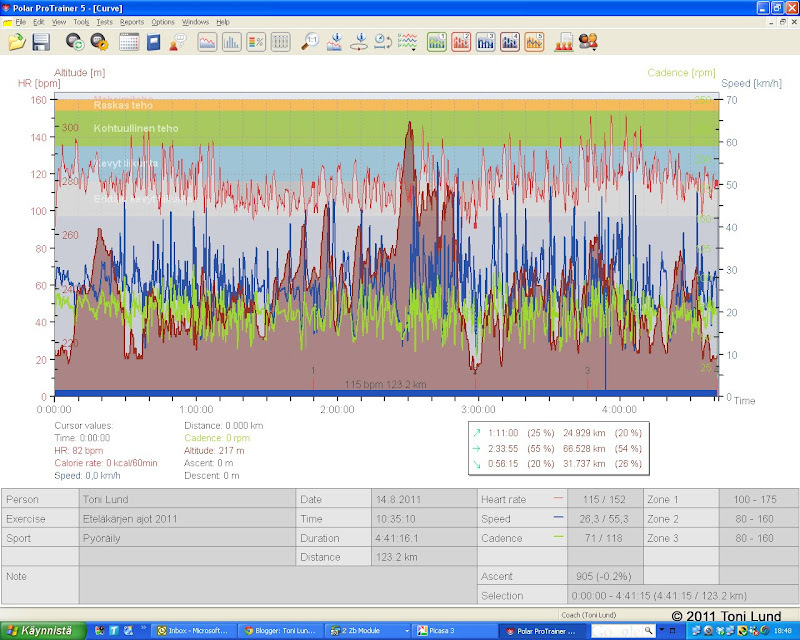 As shown above, my heart rate was very low because of the low energy level, and riding still felt pretty tough. But I enjoyed it all the way!